A colleague of mine often asks, "What's new with food?" The answer, at least for now, is quite a lot. FDA is expected to finalize at least three significant rulemakings that affect food during 2003: the trans fat labeling rule; the food processing facility registration rule; and a rule requiring prior notification of food imported into the U.S. All three rulemakings are resource-intensive for FDA. Two of the rules, facility registration and import notification, were mandated by the Public Health Security and Bioterrorism Preparedness and Response Act of 2002. The trans fat labeling rule can be attributed, at least in part, to a petition filed by the Center for Science in the Public Interest (CSPI). In other words, the three rules are significant, but none originated with FDA. Their origins reflect growing consumer and government interest in a range of issues, including food pathogens, food allergens, modified DNA, and acrylamide. At the top of the regulatory trends list is a heightened interest in food safety, the result of several food scares that occurred in the past decade. These include an outbreak of E. coli O157:H7 in Western states in 1993, as well as many similar, albeit smaller, incidents since. The U.S. Centers for Disease Control (CDC) has famously estimated that 76 million cases of foodborne illness occur each year in the U.S., 5000 of them fatal. What's being done about it? Generally, the response has been to give regulatory agencies greater control over food safety. This is happening both domestically and abroad. In Europe, where consumer confidence was rattled by Mad Cow Disease, France and the United Kingdom overhauled their food regulatory agencies. In the U.S., the President's Council on Food Safety was established by executive order in 1998 to better coordinate food safety among various federal agencies. There was talk about merging the Agriculture Department (USDA) with parts of FDA to create a single food agency, but the idea seems to have died down, at least for now. In terms of concrete legal authority, some very significant changes were contained in the Bioterrorism Act. For the first time, FDA has authority to detain food suspected of being contaminated. More specifically, the Act states that an officer or qualified employee of FDA may order the detention of any food that is found or believed to present a serious health consequences, whether related to bioterrorism or not. Previously, FDA did not have the authority to detain food (other than food offered for import) short of a seizure action undertaken in cooperation with the Department of Justice. What does this mean for food processors? Among other things, it means FDA inspectors might be poking around a little more closely for evidence of microbiological contamination or conditions that could lead to it. For instance, don't be surprised to see inspectors taking more environmental samples. What are food processors doing in response? Many are increasingly adopting Hazard Analysis Critical Control Point (HACCP) plans to control food pathogens. 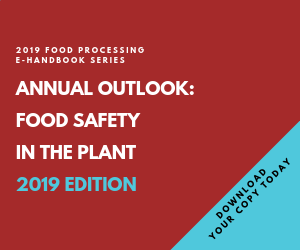 Certain types of food processing facilities are required by regulation to follow HACCP plans, specifically those that process seafood, juice, meat, and poultry. Other segments are turning to HACCP voluntarily. In a nutshell, HACCP involves analyzing potential contamination hazards, identifying critical control points, and establishing preventive measures and a monitoring program. If there's some good news in this, it may be that the incidence of foodborne illness is on the decline. The CDC recently announced a reduction in the incidence of foodborne bacterial illness since 1996. Food manufacturers are also dealing with a heightened interest the potential presence of allergens in food. Undeclared allergens continue to result in the greatest number of food recalls. This situation occurs when an allergenic ingredient is accidentally added to a food or when a food is improperly labeled, so that the food doesn't accurately reflect the presence of a given allergenic substance. These issues notwithstanding, some consumers feel that food labels could be improved to provide better information to individuals who suffer from food allergies. In 2002, legislation was introduced in Congress to amend the Food Drug and Cosmetic Act with regard to allergen labeling. The Act currently requires food labels to provide an accurate list of ingredients. The new provisions would mandate a listing of ingredients derived from defined allergenic sources, and in plain language that identifies the source, even when the ingredient or substance might otherwise be exempt from the ingredient listing requirement (e.g., as a processing aid or flavor). This bill was not adopted in the 107th Congress, and does not appear to be a high priority in the 108th Congress. The food industry, however, has taken note of consumer concerns regarding allergen labeling. The investigation into acrylamide will continue in 2003 and probably beyond. It was discovered in 2002 that acrylamide, which is believed to be carcinogenic, apparently forms naturally in certain starchy foods when they are cooked at high temperatures. Thus far, FDA has not recommended that consumers change their diets to avoid acrylamide. FDA's action plan includes further research about the safety of acrylamide in the diet. Ultimately, one of two things will happen: (1) acrylamide won't be found to be as dangerous as previously thought, or (2) acrylamide will be reduced or eliminated from the diet. If acrylamide is not exonerated, we can probably expect to see a greater focus on toxic substances that may occur naturally at low levels in food. These recent moves seem to point toward more regulatory oversight and more interest in potentially harmful substances that may be present at low levels in food. This interest is likely to be fueled by developments in analytical testing. Testing laboratories are promoting their ability to test food for ingredients derived from genetically modified sources, pathogens, and pesticide residues. The bioterrorism legislation calls for the development of new test methods aimed at easily detecting dangerous contaminants intentionally added to food. In the not too distant future, don't be surprised to see the promotion of test kits that consumers can use at home to check food for allergens, GMOs, and pathogens. For the past several decades, FDA and the food industry have enjoyed a cooperative relationship which has produced good results in terms of food safety. Hopefully, this will continue long into the future. It requires a significant amount of self-policing by the industry, and it also requires consumer confidence in the safety of the food supply. If we experience confidence-rattling food scares, Congress and FDA will be quick to announce responsive new measures to protect food safety. This would likely include a revival of the single food agency idea and a proposed new Food Safety Act that would serve as the authorizing legislation, complete with a wish- list of regulatory authority. All of this points to self-policing as the best way to avoid food scares and the best way to avoid excessive regulatory oversight.